The powder house was built in 1642 to provide safe storage for gunpowder for use by the military in the Royal Burgh of Irvine. 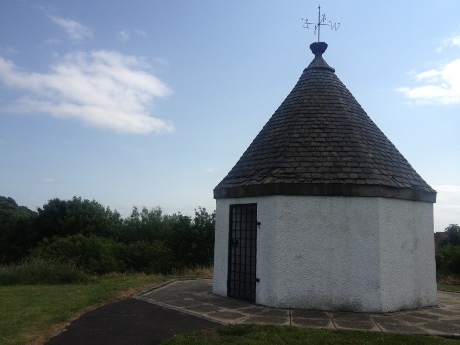 The Powder House in Irvine is a rare survival and was possibly first constructed in 1642, as records show that orders for large quantities of gunpowder were met in 1643, 1644, and 1646. James VI, of Scotland, had instructed that all Royal burghs should have powder magazines. The saltpetre derived from deposits in byres, stables and doocots would be stored in the Powder House. Plans for rebuilding it were made in 1781, at the time of the Napoleonic Wars, and accomplished by 1801; its use was discontinued in 1880. When the Golffields wash-house was demolished in 1924, its slates were saved by Provost R M Hogg for restoration of the Powder House, a rescue assisted by Rev. Ranken of the Old Parish Church. It was repaired in 1961 and again in 1992 by Irvine Development Corporation. It is an attractive and well built octagonal building topped by a weathercock. The 1870 print shows that it was placed in a remote situation, a golf-course being developed around it in later years and when this closed it remained, still fairly remote, in a small park next to the old manse. Ironically, Irvine is close to the site of the old Nobel ICI explosives plant at Ardeer, which from the mid-1930s become the centre of gunpowder manufacture in Britain; and was the last site in Britain to manufacture gunpowder.